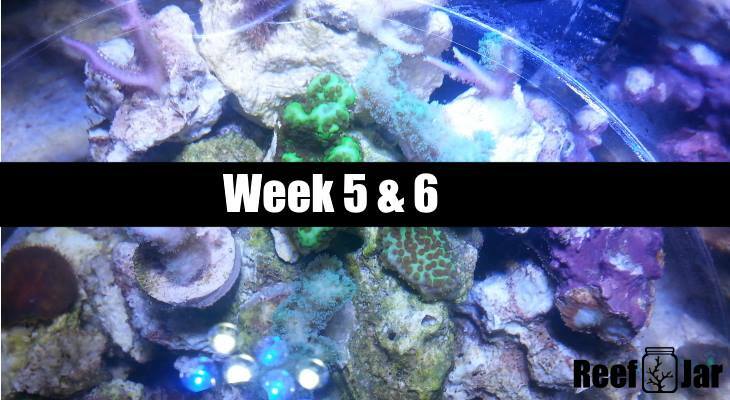 There wasn’t much to update for week 5 so I decided to combine my thoughts with week 6. 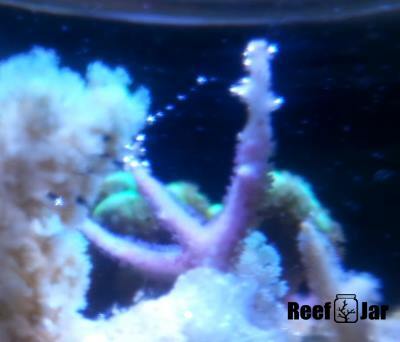 This may happen more frequently in the future since the growth of corals is slow going and the stability of the jar increases. While I know that coral growth takes time, I’ve been feeling a little impatient for the jar to be grown out. So one way I can help satisfy my desires is by adding more corals. 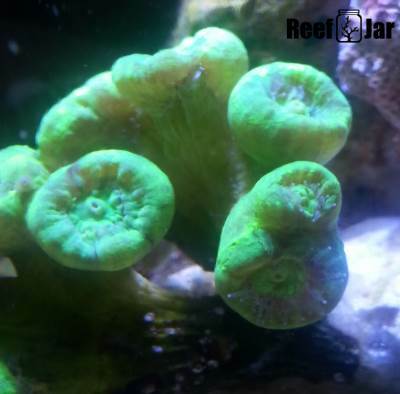 I believe one of the benefits of adding more corals “slowly” over time is that the overall stability of the jar remains consistent without creating intense stress responses from new and existing corals, which could ultimately cause water instability. I’m not sure of the bio load impact in such a small space, but I would imagine even the small load that corals contribute can be quite substantial in a small volume of water depending on the type of coral. As you can see, I’ve shifted some things around to make room for more corals. I expect by next week I’ll have added some a few more frags. 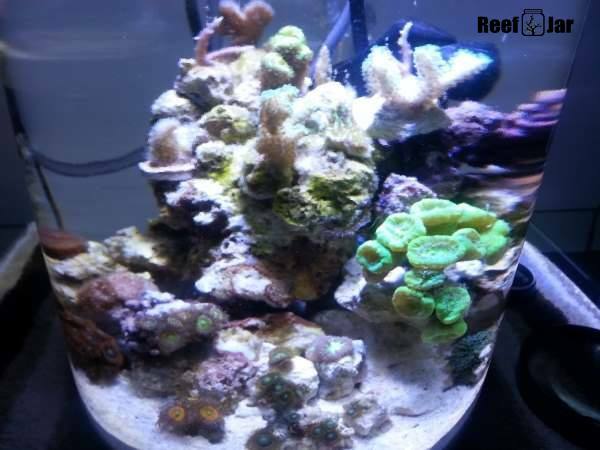 No matter what size reef tank you own, observing your corals can and will tell you a lot about their state of health. Early in week 5 I adjusted the height of the Par38 12W bulb to 5” over the jar from 9”, thinking that the SPS corals would love the extra intensity. The result is that the teal/green birds nest has become a lot lighter in colour. Notice in the picture above, the skeleton has turned white on the birdsnest on the right side, while the one on the left still a bit orange. Both of theme needed less light, more so for the one on the right side. The unidentified SPS became whiter than it was. It wasn’t bleaching from light burns but I do think that the extra light has caused their colours to fade. I moved the light to approximately 7” above the jar. Since I’ve moved the light and some corals within the jar, the unidentified SPS has gained a bit more of an orange skeleton and blue highlight on its clear polyps. I’m still waiting to see some changes with the teal birdsnest. I noticed the intense light had an impact on a single white stripe brown paly lower in the jar. It started to turn green with a cool effect between green and dark green striping, grey mouth with purple lips. Not only that, it also produced another polyp. So I have moved it in a spot to receive more light than in the past to help preserve its new look. The Chocolate Chip Montipora that has previously been attacked by nudibranchs, had a peroxide bath, and a bout of STN started to gain its green colour again. 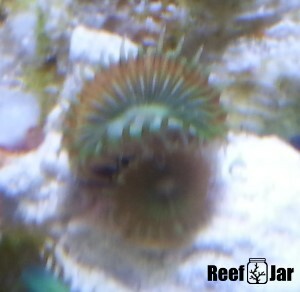 It has great polyp extension and starting to show small signs of growth where it was fragged. You can see it in the picture above. The Pink Birdnest is growing quickly. I noticed that the small white tips have expanded quite a lot with many branches starting to form from them. The following picture also shows some micro bubbles caught up in some random slime. The Montipora Confusa has always done well in the jar but recently I noticed polyp growth on its white tips. The tips were where skeleton growth occurred from the mother colony before it was fragged for me. I’m not sure what that means exactly. 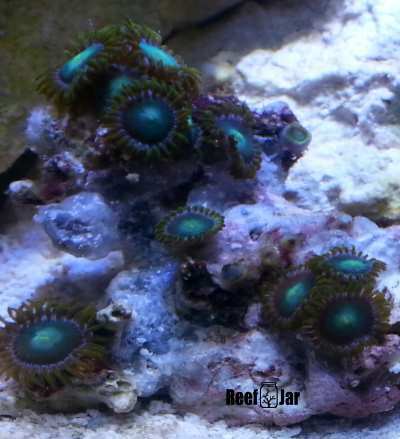 Does this mean that the tips will be covered with polyps and no further growth will occur? Or does this mean there will be new growth, but not as fast or as big? I’ve always been under the impression that growth starts with white tips. I’m looking forward to see how it progresses from here on out. Since I’ve cleaned up the Radioactive Dragons Eyes and got rid of all algae and aiptasia, some polyps that never opened have opened! The rock has a lot of super glue on it but I hope that the polyps will start to spread over top of it. 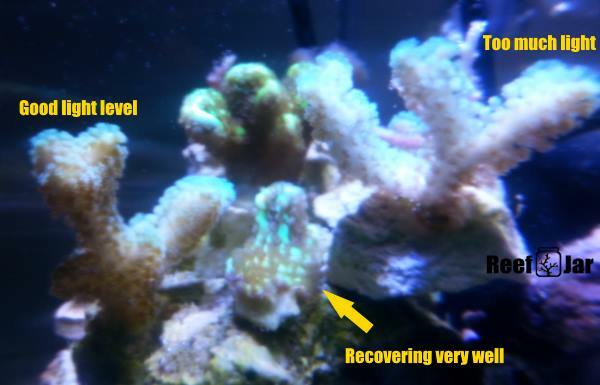 The Candy Cane Corals continue to do well since their recovery. I’m noticing extra heads forming.The bastos appear to be doing well, nothing major to report on them. They are puffy with tentacles out and always willing to accept food. Previously, one of the small Ricordia Mushrooms let go of the rock. I’m not sure of the reason. I had treated the rock with H202 so there is a chance some irritated it. When I did a water change, I somehow lost the mushroom. I think I may have siphoned it up during a water change and discarded it. Recently a larger ricordia released itself from the rock. I believe it did so for one of two reasons. The first is that the larger ricordia was overlapping it when fully expanded. The second could be that it wasn’t getting enough light. The reason it wasn’t getting enough light was because I had moved the entire rock underneath the candy canes which shaded the entire thing. For now that loose ricordia is on the sand bed under the light. All other zoas and palys appear to be doing well, although the Sunny D’s could probably use more light to help brighten up their colour. There’s always going to be some form of algae in the jar, but seems to be under control right now. I noticed some brownish algae growing where the air bubbles travel up the rock and against the airline. However, this algae is easy to wipe off at any time with a paper towel or toothbrush. I’ve been observing the jar closely to see what kinds of life are kicking about. It’s exciting to see such a variety from what seemed to be very little in the beginning. There are a few types of pods in the jar. I’ve noticed some copepods molting which is a great sign that they are doing well. I observed some extremely quick amphipods chasing each other around. Yes, I have flatworms! I’m assuming they originally came from the LR. One day I noticed a small red spot on the glass. When observed closer I realized it was a flatworm. I took great care to keep searching and found a total of 3. I removed them but I know that there are more inside somewhere. I don’t plan to use any chemicals to rid of them, unless I notice the jar being overwhelmed. For now, they are helping keep the glass clean. 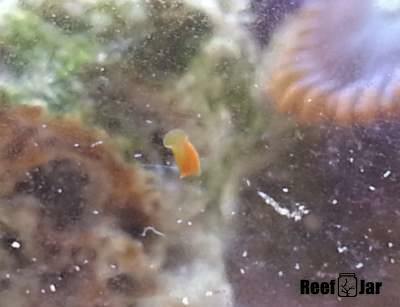 I noticed some grey looking snails when I was moving frags around. They don’t seem to be harming anything, so I’ll leave them be. I saw this big guy after the lights were out. 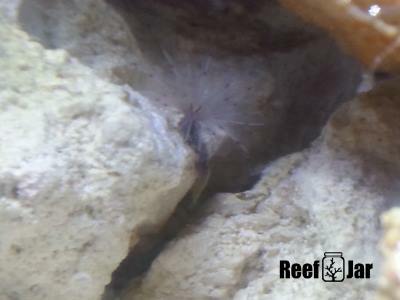 This feather duster was attached to the flaming goblins zoa frag, but after moving the frag, its feather end was in the sand. 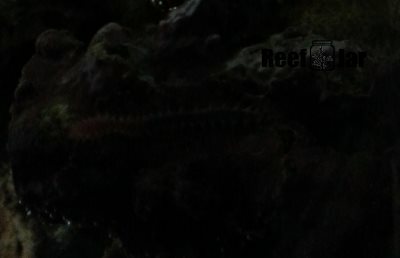 I noticed the worm moved to another location in the tank. I’ve never seen a complete worm, but here it is. I’ve been keeping up with weekly water changes, sometimes add another water change mid-week if I need to spot treat algae. Once thing I’ve noticed is that if I feed corals 2 hours before I drain the jar and spot treat algae, they will regurgitate the food once things have settled down. I may need to add more time before tampering with their environment. That’s about it for now, see you in the next update!